The evening of September 21, 1922 was a fateful one for infamous bootlegger Emperor Pic of the Crowsnest Pass in southern Alberata. In the aftermath of an attempted illegal liquor run and an ensuing Alberta Provincial Police pursuit Picariello and associate Florence Lassandro gun down an unarmed Alberta Provincial Police officer outside his office and home in downtown Coleman. After their arrest and a sensational trial the two are hanged the following year. Forgotten in the splash of media coverage are the victims, Steve Lawson, and his wife and five young children who witnessed his cold-blooded murder. 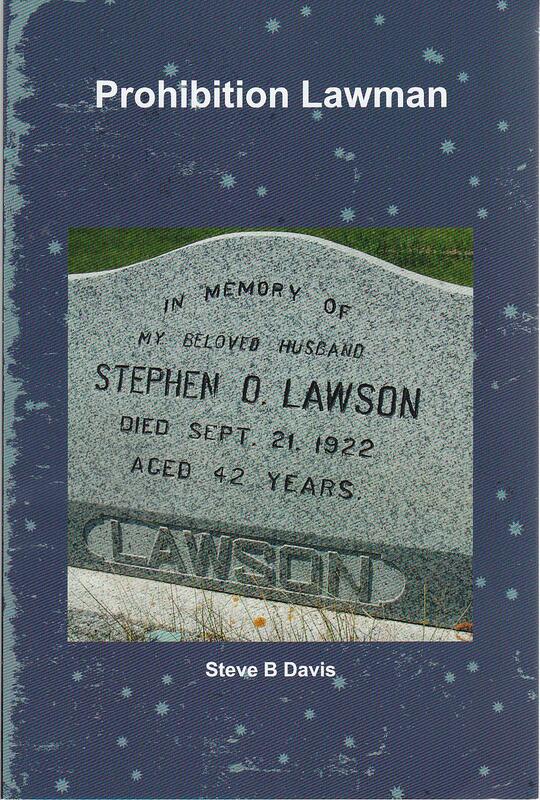 Read how the inadequate resources of the Provincial Police, and an unenforceable law, prohibition, resulted in Lawson’s death and the lawlessness of the Crowsnest Pass. Soon to be available on Amazon, Barnes & Noble, Kobo, Google Books and many others. My kids and I visited the RCMP Police Dog Service Training Centre yesterday. It’s located in Innisfail, Alberta just south of Red Deer along Highway #2. This is the national centre where all service dogs and their handlers are trained. The centre has been located here for 50 years. Prior to that several centres were located across Canada. For those non-Canadians reading this RCMP stands for the Royal Canadian Mounted Police. They are the federal police force of Canada, but also are contracted by eight provinces to do their provincial policing. The only existing provincial police forces are in Ontario and Quebec. Every Wednesday afternoon at 2:00 pm during the summer months of July and August the centre puts on a free demo and information session open to the public. The day we were there it was very well attended, around two thousand persons. The grandstand was filled to capacity with standing and sitting room only on the grass next to the fence. The sessions last about 45 minutes and include search and apprehension skills. There is usually a chance to meet a dog up close and sometimes there are puppies, but this isn’t guaranteed. Training is done on site, but the majority of the training is conducted outside in the real world, nearby farmer’s fields, wooded areas, industrial areas and residential areas. 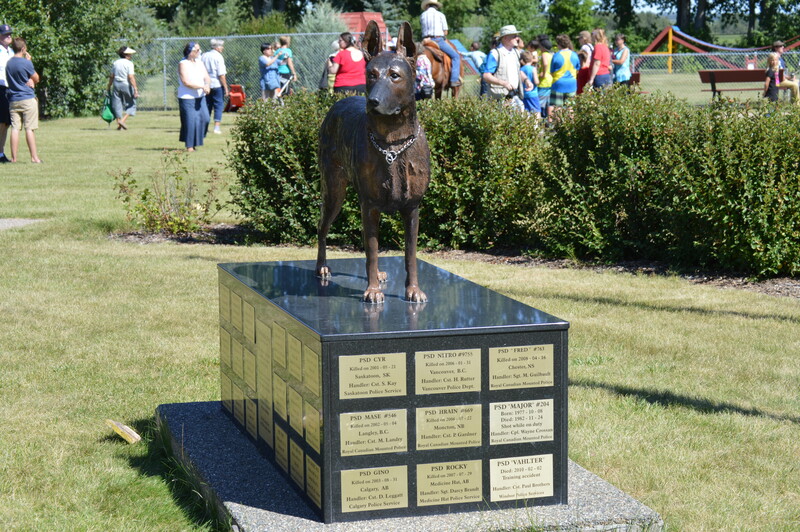 Finally near the entrance and the grandstand there is a memorial (pictured) to all the dogs lost during service. Adjacent to the memorial are the graves of some of the dogs. RCMP members occasionally used privately owned dogs to assist them from 1908 to 1935. Then in 1935 the force acquired three German shepherds. Later in 1937 satisfied with their performance a training school for dogs was established in Calgary, Alberta. The first case won with dog search evidence occurred in 1940. The present training centre was established in Innisfail in 1965. Staff consists of officer in charge, one program manager, one senior trainer, five sergeant trainers, one acquisition sergeant, two corporal pretrainers and support staff of six. German shephards and Belgian shephards (Malinois) in perfect condition are used. These are considered best for police work as they are adaptable, versatile, strong, courageous and can work in extreme conditions. We were told that a dog entering the program only has a 17 percent chance of becoming a police service dog. This is due to the high standards of the RCMP. 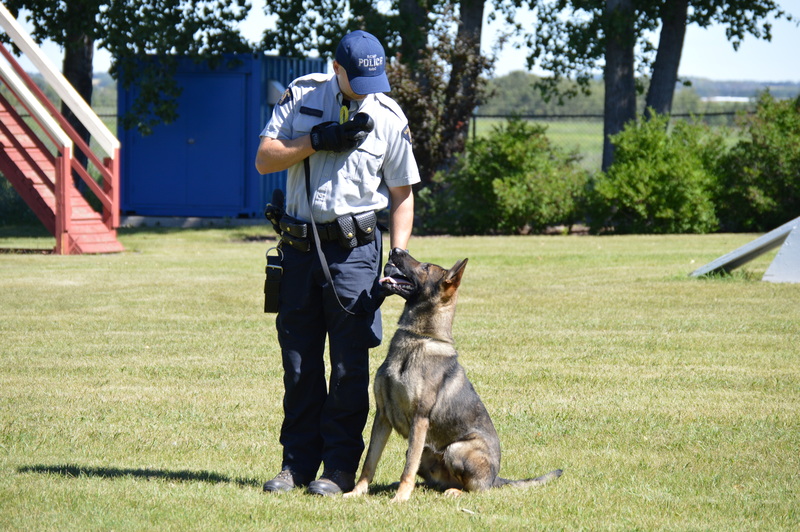 The annual cost to maintain a police service dog is less than $1000 per year. Most police dogs retire at the age of seven which was surprising to me. Dogs start training anywhere from 12 to 18 months of age. Basic training is 17 weeks, but training is on-going to maintain physical and mental fitness. Dogs and handlers are validated on an annual basis. Handlers are regular members of the force who volunteer for this duty. There is a long waiting list. Candidates are screened for selection. Obviously they must have a tolerance towards animals and appreciate dog instincts. 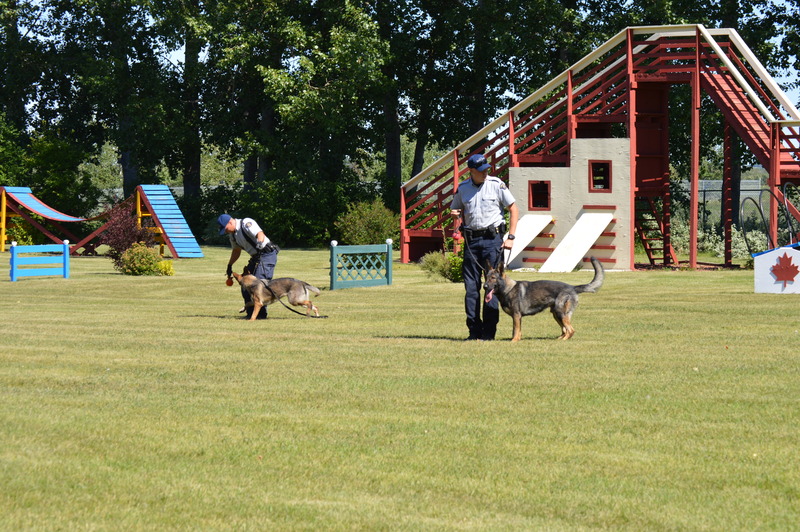 The handlers and dogs go through the training program together and form a team. Police service dogs locate lost persons, track criminals, search for narcotics, explosives, crime scene evidence and lost property. In addition they provide VIP protection, crowd control, and assist with hostage situations. The dogs are great with police and community relations. A search dog is trained for a specific skill in some cases. For instance a dog trained for sniffing out explosives only does that. Same with a dog trained for narcotics otherwise the nose get confused. The officer presenting to us said the officers need to know what’s in the package a dog finds. If a narcotic dog finds a package the officer must be assured it’s not anything else such as explosives. A dog can search a car in about three minutes. At present there are 112 RCMP dog teams across Canada. The estimated cost to train a handler and dog team is $60,000. An interesting thing we found out is that the RCMP has its own breeding program at the centre. All the dogs are bred via artificial insemination. Private individuals nearby keep the females during their pregnancy until they’re ready to birth. At that time they are brought to the centre where the puppies are born. Once the puppies are about 8 weeks old they are given to handler candidates on the waiting list to be raised and looked after until they are ready for training at 12 to 18 months of age. Many of these member candidates in waiting have raised several puppies. I think it must be hard for them to give the puppies back I know it would be for me. By the way we were told they don’t receive any extra renumeration for doing this on behalf of the force. Dogs that are found unsuitable for training are sold and the demand is high. We found the centre well worth the visit and went away with a new appreciation of these magnificent animals and their humans. With all the talk of the possiblity of Hillary Clinton becoming the first female President of the United States here’s a look back to 1919. Many historians believe that from 1919 to 1921 the United States had an “Acting President” who was a female. 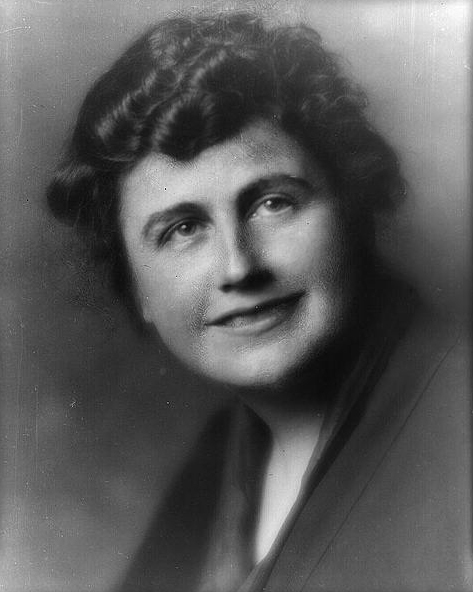 Her name was Edith Wilson. She was the wife of President Woodrow Wilson. Here’s how it happened and the circumstances leading up to it. 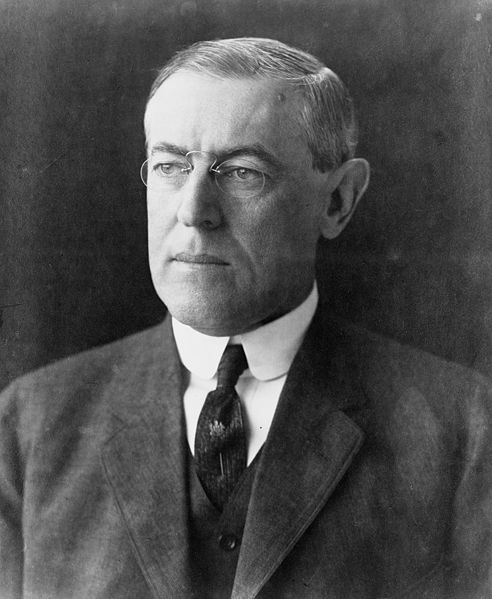 Thomas Woodrow Wilson (December 28, 1896 – February 3, 1924) served as the 28th President of the United States from March 4, 1913 to March 4, 1921. Wilson served during the World War I period. When the war began he declared the U.S. to be neutral keeping them out of the war. Isolationism dominated American politics and society in the early 20th century. Eventually events forced the U.S. to enter the war in April 1917. Wilson focused on diplomacy and financial considerations during the war letting his generals plot strategy and run the day to day operations. One of his chief accomplishments was endorsing the Nineteenth Amendment to the Constitution. This gave women the right to vote when it was ratified in 1920. In 1918 near the end of the war he issued his Fourteen Points a proposed framework for peace. After the armistice he went to Europe in 1919. There he signed the Treaty of Versailles. A key part of the treaty was the formation of the League of Nations. This forerunner was an attempt to ensure peace on a go-forward basis. He returned to the United States and began a nationwide tour to promote ratification of the Treaty of Versailles by Congress. In the end Senate Republicans rejected the Treaty. The U.S. never did ratify and didn’t take part in the League of Nations. Wilson’s power dimished as a result of this defeat. This tour and the effort to get his proposals endorsed exhausted him. On October 2, 1919 in Pueblo, Colorado he collapsed and never fully recovered. He’d suffered a serious stroke. It paralyzed his left side and left only partial vision in the right eye. This left President Wilson bedridden in the White House effectively incapacitated. His fitness for the presidency came into serious question. No one, not even his wife, his doctor or personal assistant was willing to start the process of certification of fitness for office as mandated in the Constitution, his “inability to discharge the powers and duties of said office”. Vice President Thomas Marshall was ignored and not even considered to take over until Wilson regained his health. “I studied every paper sent from the different Secretaries or Senators and tried to digest and present in tabloid form the things that, despite my vigilance, had to go to the President. I, myself, never made a single decision regarding the disposition of public affairs. The only decision that was mine was what was important and what was not, and the very important decision of when to present matters to my husband”. This sure sounds like she was “acting” as president. Many in Washington began referring to her as “the Presidentress”. Even though Wilson was secluded in the White House in 1920 due to his stroke he still formulated a strategy for reelection. This attempt at a third term deadlocked the 1920 Democratic Convention. The party ignored his reelection attempt and he withdrew. Eventually the Democrats nominated Governor James Cox of Ohio. The general election was won by Republican candidate Warren Harding and Edith Wilson’s quasi-presidency ended. Obviously not officially recognized Edith Wilson was “Acting President” from October 1919 until 1921, the end of her husband`s second term. Eventually this complex example formed part of the argument for passage of the 25th Amendment to the Constitution. This amendment clarifies the incapacity issue and provides a clear mechanism for certification of a president`s ability to discharge his duties. You are currently browsing the WRITINGS & RAMBLINGS blog archives for August, 2015.